Costa Rica was everything and more than we expected! Our team was made up COTR Pursue Missions, Lubbock, Texas and Lakeshore Church in Rockwall, Texas. It was glorious to see these two churches work together in unity according to Psalm 133:1. Our daily schedules were full of work and ministry. The work projects were not without challenges, due to last minute changes made before we arrived. However, thanks to our team’s patience and diligence we were able to accomplish 90% of what we needed to. We laid a large tile floor for the parsonage, put the lath on church’s stairwell and painted one of the upstairs classrooms. We preached and ministered in the Sunday and Wednesday church services. We also held a vacation bible school that had 150 children and young adults in attendance. Out of those services 15 children and three adults made first time decisions for Christ! In the women’s conference, 40 women received the word of God, prayer and a great outpouring of the Holy Spirit. This October we had the wonderful privilege of traveling to the city of Alexandria, Ukraine. As our train pulled into the train station we were greeted by cold rain and the warm hearts of the pastors who have patiently waited for God to send them someone who would train and encourage them. Our team’s expectations were high, but we had no idea of how extravagantly God would pour out His Spirit. Our first night with the pastors was a time of fellowship and a dinner. As we finished our meal the pastors began to share their testimonies of how God transformed their lives. Most of them were saved after the fall of Communism in 1991. One such person is Pastor Veleri (right) who was a Communist and a Russian pilot who fought in the Afghan war. After the fall of Communism his life and marriage began to fall apart and as the door for missionaries opened he heard the Gospel for the first time and responded to the invitation to receive Christ as his personal savior. 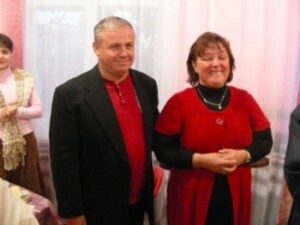 He now pastors a substantial church and is the leader of the pastoral alliance in Alexandria, Ukraine.